This section on KnockoutJS covers almost all the topics which are required for a basic understanding and to get a feel of how it works. 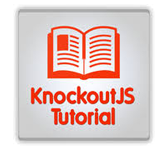 KnockoutJS tutorial is specially designed for a software programmer who has zeal to learn the basics programming concepts in a simple and easy way. This chapter will also give the learners, an enough understanding on the components of KnockoutJS with suitable and best examples.